The projects I worked on were Celestial Dragon and 'Insanity'. 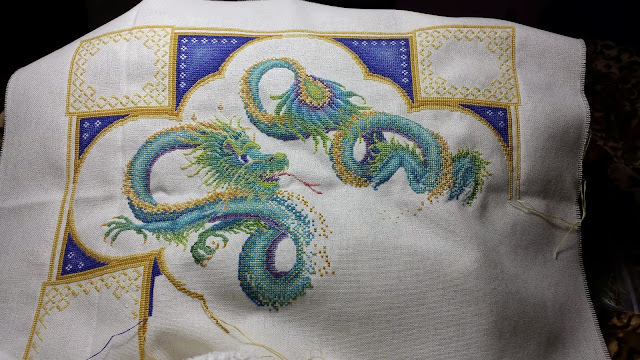 Not as many this month but I got far on the dragon. Getting close to completing page 3. I realize it's not the flattest picture, but it was draped over my knees. Yes, yes yes. I know I'm late. I actually reached the halfway point early on Saturday but I just kept going, not bothering to take a picture until late Sunday. As compensation for my lateness, I present my current progress on Insanity. And as a bonus, a cute picture of Onyx. 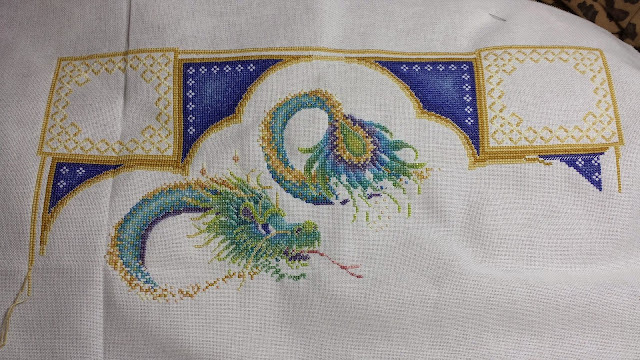 Well, I frogged what I needed to and continued on with my dragon. The tail is almost complete. 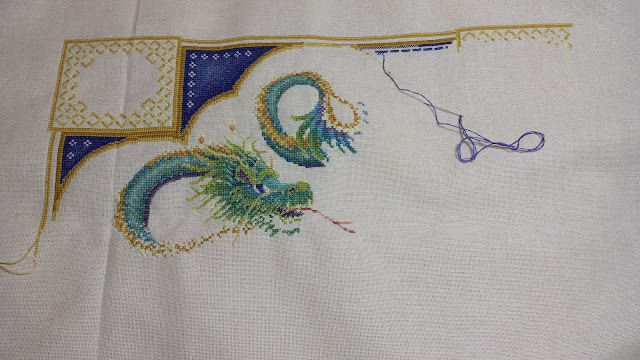 After a bit more on the border it's back to the body with another coil. I'm enjoying the Olympics, nice to have on in the background while I stitch. I would love to be able to be a part of something like the opening ceremonies. Anyone know an opening in the tv/film industry in the New York City area? Still looking, and replying, and hearing crickets. I'm a bit late on my weekly post. I finished the first page of Celestial Dragon. 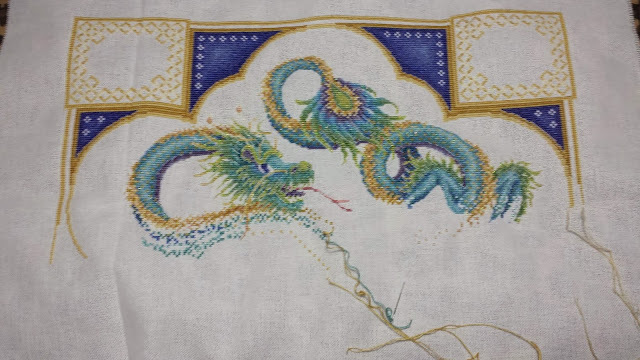 I do like the color blends on the dragon, especially the tail. As I started on the second page, I then noticed I had added an extra stitch, causing the entire section of the right square to be shifted over by one. Which means I have to frog it. That was Thursday night. Friday i didn't feel like frogging. Just something a bit less taxing. So crochet it was, but not something I had to think about where I left off. So I started a new afghan. And just for cuteness factor, Onyx drinking the remains of my mom's tea. Excuse me while I go frog some stitches on this snowy day.